Tiger Salamander is a species of amphibian family of the animal kingdom. They belong to the burrowing category. Find some interesting facts about tiger salamander. Tiger salamanders secret a slimy substance which is poisonous to other animals. Fish, toads, and other aquatic animals eat up tiger salamander larvae and thus they produce the poisonous mucus to protect themselves. Before mating male tiger salamanders mimic a female tiger salamander to slink in and drop his germ cells on rival male tiger salamanders. Tiger salamanders’ tails do not possess fracture regions. Some of the smaller species of tiger salamanders do not have lungs and they breathe by the gular pumping. Tiger salamanders are one of the endangered species nowadays. Length – Tiger Salamanders mostly grow till 9inches to 12inches. Though sometimes, some of them can grow till 14inches. Head – Tiger salamander has a blunt nose, flat head, and small eyes. Their heads resemble to toads. 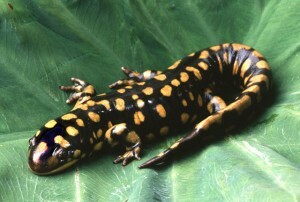 Tail – Tiger salamander has a long and thick tail, which are toxic. Feet – Tiger salamander has four sturdy feet, two in the front and two at the back. The front feet have four toes and five toes at the back. Colors – Tiger salamanders come in a wide range of colors. Usually they come in dark grey, green, black, and blue base on the skin. Their skins are spotted, barred, patched, or stripped with white, orange, or yellow. There are also albinos amongst the tiger salamander species. Skin – Skin of tiger salamander is scale-less, moist and shiny. Being an amphibian tiger salamanders are found near water bodies only during monsoon, which is their breeding season. They are usually found near marshes, streams, ponds, and other small aqua bodies. 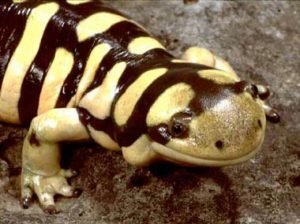 Apart from monsoons the tiger salamanders could be found in field, forests, prairies, and other soft ground lands, where they can hideaway under the tree leaves, or underground, or under the litter. On average tiger salamanders live for about a time span of 12yrs to 15yrs. They attain their sexual adulthood at the age of 4yrs to 5yrs. Tiger salamander is found near South Dakota, near west river, and east of the Missouri river. Some of the species are found in northeastern parts of the state and some are found in southeastern counties. There are many sub-species of tiger salamanders. Eastern Tiger Salamander is generally dark brown or black skinnerd with blotches or spots of yellow or olive. Scientific name of Eastern Tiger Salamander is Ambystoma tigrinum. It is foud near Nebraska, eastern Texas, Kansas, and New York. Barred Tiger Salamander is also dark brown or black skinned with yellow vertical stripes on it. 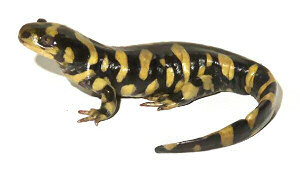 Scientific name of Barred Tiger Salamander is Ambystoma mavortium mavortium. It is found near southern Texas, central Colorado, new Mexico, and central Nebraska. 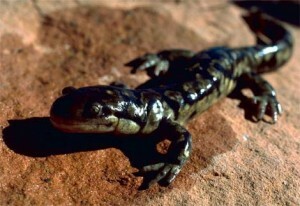 Arizona Tiger Salamnder is black or dark brown skinned with tiny and very few yellow spots on it. Scientific name of Arizona Tiger Salamander is Ambystoma mavortium nebulosum. It is found near Arizona, Utah, new Mexico, and central Colorado. Blotched Tiger Salamander is smaller in size than Arizona Tiger Salamnder. It has light grey, or pale ground colored skin with webbed dark markings on it. Scientific name of Blotched Tiger Salamander is Ambystoma mavortium melanostictum. It is found near southwest Saskatchewan, northwest Colorado, Nebraska, and southern Alberta. Grey Tiger Salamander is brown and olive skinned with black spots on it. Scientific name of Grey Tiger Salamander is Ambystoma mavortium diaboli. Sonoran Tiger Salamander resembles to Arizona Tiger Salamander or Barred Tiger Salamander. Scientific name of Sonoran Tiger Salamander is Ambystoma mavortium stebbinsi. It varries in colors. It is found in Patagonia Mountains and Huachara. Tiger salamanders are now becoming endangered more than ever. Their habitats are usually the water bodies in monsoons, where there are lots of fishes which are their predators. Sometimes even when humans are fishing the tiger salamanders also get caught in the fishing rod and are killed. Other parts of the year the tiger salamanders reside in the forest and other marsh lands where they dig under the soil. Sometimes they even get squashed under the traffic. Humans are getting interested in petting tiger salamanders and thus they have a growing demand in the black market as well. Not always that the tiger salamanders get tamed and accustomed to the new environment, and they eventually die out of the change in their natural habitat. Tiger salamanders are becoming more popular as pets than ever. The cage should be ideally 15gallons for one tiger salamander. The housing should be provided by the natural ambience of the tiger salamanders as much as possible. It should have parts of both land and water bodies. The cage should not come in contact with any pesticide. The ground should be provided with a thick layer of soil to allow the tiger salamander digging in it. Some rocks, aquatic plants, etc. nee to be placed in the water body for the female tiger salamanders to help attach their eggs while breeding. Tiger salamanders require a daytime temperature of 68degree to 72degree F, and at night they require around 50degree to 60degree temperature. Tiger salamanders require quite a high level of humidity, around 70%. Tiger salamanders should be ideally fed in every 2-3days. They survive on bugs, insects, smaller amphibians, etc. They are not very selective regarding food. After mating, the female tiger salamanders lay eggs, which they hide attaching them to the aquatic plants, logs, and stones under water. It takes around 4weeks for the eggs to hatch, and comes out small larvae which have feathery gills. The larvae stay under water till they reach semi-adulthood. At this stage they tend to shift to more earthly plots. The tiger salamanders become eligible enough for sexual activities at around 4-5years. The tiger salamander eggs can grow into cannibal and normal morph larvae, and neotenic, air-breathing cannibal, and only air-breathing adults. Check out the pictures of Tiger Salamander to know more about its appearance. Tiger salamanders feed on worms, little mice, insects, other smaller amphibians like tadpoles, small snails, etc. Tiger salamanders are used to eating once in every 2-3days at least. Calcium and vitamins are a must in their diets. Tail of tiger salamanders are toxic and if by chance are eaten then death is inevitable. Some species of tiger salamander secrete mild poison in form of mucus on their skin. Though not fatal but this poison can cause serious harm to human beings. Tiger salamanders are a wonderful species of amphibian family, which is endangered now. They need to be conserved. They can be wonderful pets if kept properly. But if thought to be petted then they need lot of care and a surrogate natural atmosphere. I NEVER KNEW SUCH CREATURES EXISTED , EVEN MORE SO , IN THE US. CONSIDER ALL THE WORKS THY HANDS HAVE MADE”. I know where you could buy salamanders for pets. They are easy to take care of and are fun to watch! Our salamander of 15 years just passed and looking for another where can you buy them at? Omg I love these animals do you? We accuired 2 salamanders from a field biology class. And have been taking care of them for almost 4 weeks. They are still in the tadpole stages of life. They are called “Waterdogs” I can not find any information about waterdogs but know they eat small tadpoles and can eat 10 in a day. Their color is starting to darken and their gills are very furry. I will post again in 2 week if big changes occure. My boyfriend recently brought home 12 of these awesome creatures! Not sure I like them or know what to do with them but they are pretty neat. Also, it is best not to handle them due to the oils in your skin is poisonous to them and can make them sick or could kill them. He’s about to shed the skin from the head to the tail and the eats it for vitamins? I found TWO of these in my basement. Wow, I guess I’m lucky since they are endangered. i have a tiger salamander and i hold him all the time. i wash my hands before and after i hold him. i allow my seven year old to hold him to when hes being still of course.if they are really poisious then well i havent been sick at all from him and ive had him for a little over ayear. TIGER SALAMANDER WILD FOUND IN RICHMOND VA ……. I came across a tiger salamander in my shop about a week ago. This is probably the biggest salamander I’ve ever seen in real life. I ended up putting it in my terrarium because I was afraid my cat was going to get it. It is a really neat animal and seems to be adjusting well to his new environment. I haven’t decided whether to keep it or donate it to my university’s Biology department since they helped me identify what kind of salamander it is. Is there any way to tell if it is a male or female just from looking at it? You can see two little “balls” on the males. I had news and salamanders as a kid and just loved them! I just got 3 salamanders from a friend and have them all set up in a big reptile aquarium. They have a waterfall, a pond, an overturned log, several semi-aquatic plants, and their substrate is several mosses and bark. All natural, no chemicals or dyes. They are very happy! Already digging under, eating good, swimming, and exploring. Yea! I just recently found two Tiger Salamanders in my garden and I think they are the coolest things ever. I named one of them Butch because he thinks every thing is food especially fingers and the other one is Sharky because he likes to drown the bugs he catches. Sharky is very sweet. I thought it was crazy when I figured out that they were endangered because there are so many at the drainage pond near my house. They really like worms meal worms and the pupas from the meal worms along with the beetles from the meal worms. They are also very easy to train. I can just tap on the cage top befor I take it off to feed them and they both come out of thier caves. If I make a clicking noise then Sharky will crawl into my hand… I’ve only had them for about 2 weeks now. Ive been taking care of a tiger salamander that I rescued from being eaten by my mother’s golden retriever and a couple barn cats that we own…ive had him/her for the past year…but recently weve let it go. I just found two of these in my backyard today and three in my backyard last summer. One of the ones we found today is near death. We named them; paco, albin, Samuel, Simon, and perpetua. I have lived in Colorado 34 years and never knew these were “common” in our area. I rescued one thinking it was a pet someone threw out-my son wants “spot” to stay. I need all the info and advice I can get. I just discovered one in my horse’s water tank. It is about 4 inches long. My concern is that one of my horses or my cat will bite it (poison???) while taking a drink on these hot days. Should I remove it or leave it alone to eat the bugs? My Husband and I were on a hike and we discovered a huge pond hidden in some thick mountain terrain that had well over a fifty (or more) Tiger Salamander. It was a site to see considering we had never even heard of a Tiger Salamander. The Tiger Salamander,s was huge, I couldn’t believe it. We could see them in the pond, but could not decide if they were fish do to the size of the Tiger Salamander. After doing some research it does not say much about Tiger Salamanders in Utah so my question to you is..is it common to find Tiger Salamander in Utah. how much are these thing worth?? Here in Colorado, I found one in a window well. I decided to keep it. When I went to PetSmart to get info, I found out that here in Colorado, it is ok to have them as pets but it is illegal to buy or sell them here. What is the proper way of holding one of these amazing lizzards? Simple answer: You don’t. They are very sensitive to the oils in your skin and it can make them very sick. also, they can secret a slim that is poisonous. It is designed to kill most animals that eat it but it would probably just make you sick if you get it on you and you wash your hand before preparing food or sticking your fingers in your mouth. North Central Indiana! Tiger Salamander spotted! He was on the sidewalk, in 40 degree weather! I have him in an aquarium now! Feeding him earthworms till it gets warm out, then I will let him hang out in the yard! hey guys, I think i have found a tiger salamander, it was under a bag of trash in the yard and it is missing left front leg. I think a cat drug it from a small pond near the house. Its about 4 or 5 inches long hefty tail, olive green with like white splotchy spots and a few black spots. Is there a way to post the pictures of it on here? so i can know for sure what I found? I think its very young. I found two tiger salamander’s in my basement window ditch. The baby was crawling around and the mom was borrowed under a tennis ball. I was afraid it’d be too cold down there, so I rescued them. I put them in my backyard garden. The mom took off and the baby is wandering around:( I’m hoping I did the right thing, but sad I may not of. These two we’re found in Lafayette, CO and it’s not the first time we’ve had a cute lizard in our basement window well. this webpage is truly amazing. I touched the tail and it spewed something on me, what will happen? Tiger salamanders are poisonous, but only if you deliberately eat them or put your hands in your mouth after touching them. The stuff it spewed on you is poisonous, so just wash your hands and you will be fine. the poison is not strong enough to kill a person, but to be on the safe side just wash your hands. The salamander probably thought that you were going to try to eat it and so it did that to defend itself. normally they will not excrete poison unless they are in pain or feel threatened. I found my salamanders under a horse water tank and the other one I found by my rabbits! I handle them all the time, will that kill them? Now that I read these facts and stuff I am afraid that I can kill them. They are my favorite pets. They always have a smile on their face. I like to hand feed them cause they are VERY lazy. They like to snap at my hand so I am VERY careful. I made this coerce for them to stretch their legs but they are very slow. I found my salamanders under a horse water tank and the other one I found by my rabbits! I handle them all the time, will that kill them? Now that I read these facts and stuff I am afraid that I can kill them. They are my favorite pets. They always have a smile on their faces. I like to hand feed them cause they are VERY lazy. They like to snap at my hand so I am VERY careful. I made this coerce for them to stretch their legs but they are very slow and lazy like I said. Has anyone else ever heard sounds from them like do they learn to mimic the frog or me when i am talking to the little frogs? Do all make a noise and if so what is that sound?